Imparting Grace: How did it go so fast? My baby boy. 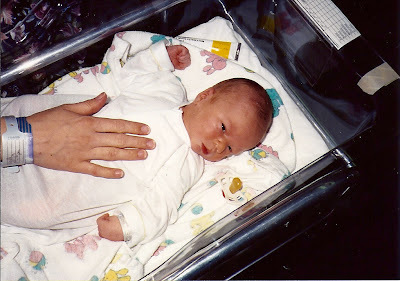 On the day we took him home from the hospital. I know he's mine; I have the ID tag to prove it. I was a 27-year-old with no prior experience and no training, yet they released him into my care. They checked his little ID tag and just handed him to me, as if I knew how to care for him. What were they thinking? His birth was just a little while ago, wasn't it? Wasn't it? Oh, no. The calendar doesn't lie. It was 20 years ago today. How very true..may God bless you again on this very special day. I know how you feel. My youngest just turned 21, oldest 31. The years do fly by so fast! Happy Birthday to your son! May he (and you) have a Blessed day!! My oldest is graduating high school this month and I completely feel this sentiment. happy birthday to your son! Aw, that is so sweet! I can't believe how fast mine are growing too, bless you for being such a loving thoughtful mama! Happy Bday to your boy! Awwww...what a sweet baby he was! I know you are on a sentimental journey today as he turns 20. Treasure the memories and look to the future with anticipation Richella. Our oldest Grandson is 20! And it has been an awesome journey watching him grow up too. So, so true! It goes by so fast! Such a sweet picture of your baby boy!!! My youngest is turning 7 tomorrow. He was just born a few days ago. Good grief! Time flies, doesn't it? By the way, you don't look old enough to have a 20 year old!!! Sniff, sniff. It's kind of sad that it's only in retrospect that one can really grasp what everyone meant by "these days will fly by". When you are in the trenches of motherhood with babies and toddlers, it just doesn't seem possible. Happy birthday to your son, and to your motherhood! Happy birthday to your son! My oldest is graduating from HS in a few weeks. Where does the time go, indeed! Aw, hug Richella! My baby will be 21 next month. Another milestone I'm not looking forward to! Amen! I just had that moment in January when my baby turned 21. My husband just remarked this weekend that on Sunday our middle child (the red-head)will turn 27...as they say, "life is but a short walk from the cradle to the grave, it behooves us to show kindness along the way.."
Happy Birthday to your sweet Boy. Children grow up and go away but the memories last forever! I know. My oldest turned 20 this year. Time just goes by way too fast. "You have to suffer grief through many trials so that the tested genuiness of your faith, more precious than gold, which perishes though refined by fire, may result in praise and glory and honor at the revelation of Jesus Christ." 1 Peter (BDV) I think one trial is the realization of the shortness of years and the length of days. I think you've had a double dose of that realization lately. May God's grace be with you. My children are only 11 and 5 and I'm already feeling that way! Masters Degree. Time really does fly. I know, I know, time flies. I can't believe I have an almost 17 year old.